“In the union, we aren’t divided by race – I shouldn’t even say ‘race,’ because that’s not real – okay, ethnicities, gender, etc. We are all equal,” Joe Tarulli, a Communications Workers of America (CWA) union member, boomed in front of a room of fifteen other union members. It was 9 AM on a cold Monday morning in lower Manhattan. Everyone was gathered, with coffee and donuts in hand, for an eight-hour political training called “Runaway Inequality,” on Wall Street, inequality, and institutional racism. The group was a mixed crowd — a handful of white men who lived in Long Island and worked as field technicians for Verizon, along with around ten black men and women who lived in Brooklyn and worked for the city government. They all were members of the same union, CWA, whose members were facilitating the training for them. Tarulli speaks with a slight Italian-Brooklyn accent; he’s lived in Staten Island for the past ten years but grew up in Bensonhurst, Brooklyn. He works as field technician for Verizon — he installs Fios service in people’s homes — a job he got twenty-five years ago, equipped with a GED and a driver’s license. Tarulli was part of the original group of CWA members to participate in the very first training a few years ago. In 2015, the CWA, one of the largest unions in America, wanted to create an intensive training to help its members understand the political context underlying their day-to-day struggles. To create the curriculum, CWA reached out to Les Leopold, director of the Labor Institute, who adapted his book, Runaway Inequality, into an eight-hour program on the systemic causes of inequality, two hours of which are devoted to institutional racism. The first one went so well that Tarulli and his fellow union members asked to be trained to teach the class to others. Since then, all trainings have been member-led. 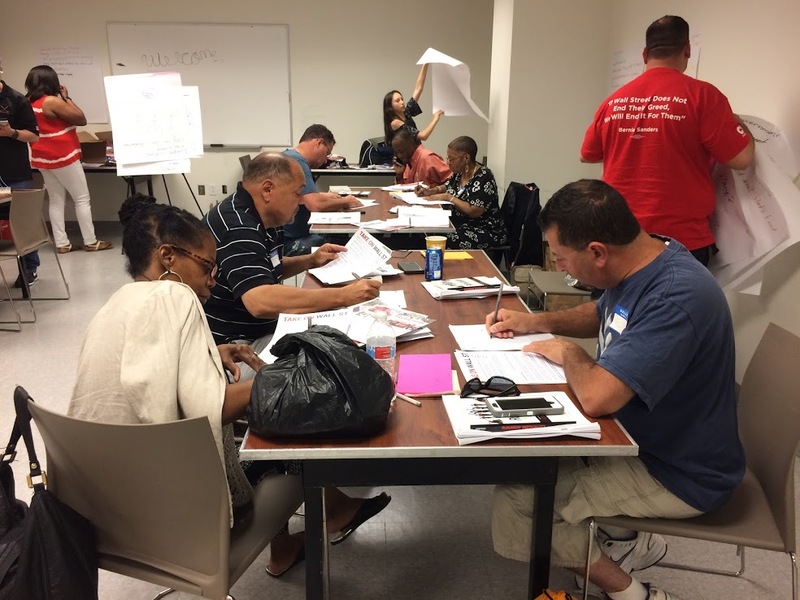 Tarulli, along with fellow CWA Staten Island-trainer Ray Ragucci have facilitated, on their own time, trainings for Sustainable Staten Island, a coalition of organizers and community members in a Trump-voting borough of New York City. So far more than 1,500 CWA members, out of 700,000 total nationwide, have undergone the program. Word about Runaway Inequality has already spread, and many community organizations, including the NAACP, have signed up to participate. Other unions have invited CWA to train their members, partially galvanized by the results of the 2016 election. Although CWA’s political training began before the 2016 election, it has only become more significant. After Trump’s victory, some on the Left sprang up to argue that addressing racism is too divisive; uniting workers requires focusing on “bread-and-butter issues” to the exclusion of all else. If there was any group that might be sympathetic to focusing on “bread-and-butter” working-class issues, it would be labor unions. But unions have learned a bitter lesson from their past: ignoring racial division has historically undermined the working class as a whole. That’s why CWA knew that it had to tackle institutional racism if it wanted to address economic inequality in America. After spending some time discussing economic inequality and Wall Street, the facilitators turned the room’s attention toward race. “The material might feel uncomfortable, but we’re not here to accuse anyone of being personally racist, but to examine the impact of institutional racism,” Sonji-Ann Roseborough, a CWA shop steward, Verizon field technician, and black woman, said to warm up the room. The two-hour section on race began with a history lesson of how the ruling class invented the concept of “race” and skin-color hierarchies to justify colonialism and slavery, and to divide those they ruled into unequal silos. The workbook described how eighteenth-century slave owners extended special privileges to poor whites to drive a wedge between them and black slaves; how nineteenth-century employers brought in Chinese laborers as strikebreakers, paying them half of normal wages; how agriculture companies exploited millions of Mexican guest workers to undermine the bargaining power of US agricultural workers in the 1960s. The section concluded with charts demonstrating glaring racial disparities in criminal justice and wealth, the most gasp-inducing of which was one that showed how white high school dropouts tend to have more household wealth than black college graduates. All in all, the message was clear: Racial inequalities benefit the ruling class, which seeks to divide the working class against itself. We must band together in solidarity against our common enemy. The Runaway Inequality boot camp thus flips the concern about the “divisiveness” of directly addressing racism. It’s racism, not addressing racism, which divides the working class. Fighting for working-class interests necessarily entails confronting and dismantling racial inequity. The framing of racial inequity as a ruling-class strategy provided a common enemy for all participants, no matter their race. There were plenty of jokes about “the man,” and particularly Verizon’s CEO — about half of the participants had been involved in a recent, massive strike at Verizon. A few weeks later, I followed up with Keith Cofresi, a white participant who had offered the most pushback during the training. A registered Democrat who lives in Staten Island, he voted for Bernie Sanders in the primary and Donald Trump in the national election. “I don’t think of things in terms of race,” he told me in the beginning of our interview. During the training, Cofresi had pushed back at one of the charts, arguing that since he knew of white people who squandered their money, race couldn’t be the sole determinant of a person’s wealth — individual responsibility had to be taken into account. CWA’s facilitators responded by pointing the room back to the workbook’s charts: “We have to respond not to anecdotes but systems.” This strategy is intentional. John O’Malley, a legislative coordinator for CWA based in New York’s Hudson Valley, has led multiple trainings. When participants argue about racial inequality, facilitators are trained not to be the authority figures but to redirect questions — “what about reverse racism?” — back to the room or to the training material. Rather than arguing when people disagree with the charts, facilitators suggest participants look up the references in the footnotes on their own. O’Malley says that in a training he led in Boston last year, a white man, whom O’Malley described as a “Trump-y kind of guy” from a “struggling working-class” background, raised his hand. His cousin had served time and was struggling to find work; incarceration affects everybody regardless of race, he asserted. After the group reviewed charts showing racial disparities in incarceration and sentencing, the man started to come around. “It seemed like he was saying, ‘I’d never thought of it that way before,’” O’Malley said. While statistics and charts can make a real impact, for some, it’s stories that matter. Tarulli described a “training for trainers” he once attended in which a white trainer said, “I grew up poor. What privileges do I have?” Afterwards, when the class broke into small groups, a black trainer, Anita, shared why she waited two weeks to name her son: she didn’t want “too black” a name because he might not get a job in the future, but she didn’t want to something too white because his community wouldn’t accept him. “That’s what turned it for me. I always got it, but I never understood how deep it really goes,” Tarulli, who’s Italian-American, said. It seems that part of what makes CWA’s training on race effective is that white people are encouraged to speak honestly — albeit respectfully — instead of being shamed into silence. Indeed, during the training I observed, although CWA’s facilitators typically called on those who raised their hands, when it came to the section on race, Roseborough noticeably called on those who did not raise their hands — the white men in the room. Given the diversity of perspectives, how does CWA create space to hold everyone together? Much ink has been spilled since the election on which matters more, “class” or “race.” With the Runaway Inequality training, it seems that CWA’s answer is: solidarity. Class can be the shared foundation motivating us to understand, rather than gloss over, racism.